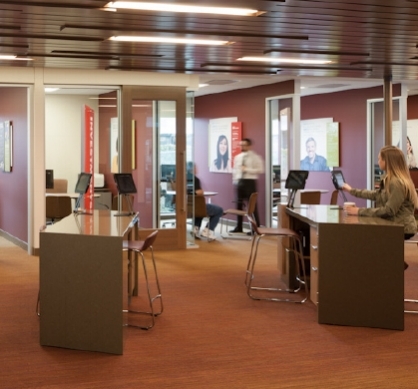 Photo Tour: BECU's high-advisory, teller-free banking branch. 6,000 square feet. Zero wasted space. And not a single teller. Not far from Microsoft headquarters, amid Bellevue, Washington’s affluent high-tech community, BECU built a flagship branch engineered for advisory, investment, mortgage, and business services. Beginning early 2013, Strum and architectural partners EHS Design, sat down with one of the country's leading credit unions, BECU. Together, we searched for answers to some challenging questions: How do we build a facility for the tech savvy Eastside community? How do we make transactions more efficient while boosting our advisory services? How do we make a statement to the Eastside that this credit union is as sophisticated in its business offerings as any local bank? 10 Months later, we had the answer. Enjoy a photo tour of BECU’s Eastside Financial Center. Together, we'll take a careful look at the spaces that make this facility so special. At BECU's Eastside Financial Center, the lighting draws you in. 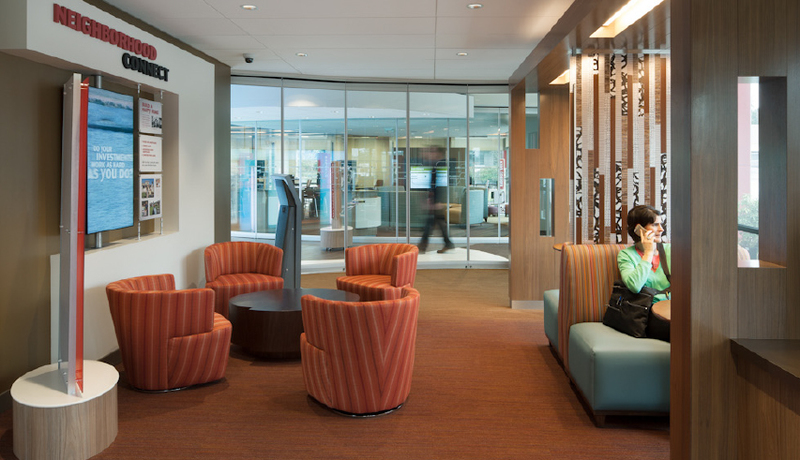 The facility is anchored by BECU's signature crimson, pops of color and light that beckon you to explore. The 24-hour smart ATM vestibule really isn't a vestibule at all. Rather, it's the first element you see when you enter a facility built for advisory services and savvy automated cash delivery. COME INSIDE, WE'RE HERE TO SERVE. This wall of smart ATMs serves the cash-handling, deposit, and withdrawal needs of BECU members. There are no tellers here. Two senior-level concierges engage guests, guiding them to the advice and solutions they're looking for — whether loan, investment, or business related. The ATM wall is bathed in beautiful and ever-changing LED light. A ribbon of 5 digital monitors spans the space, showcasing dynamic motion graphic content that ranges from brand-building messaging, to gorgeous local NW scenery, to campaign promotions. This area of the branch is open 24-hours a day. Glass "nano walls" roll out on hidden tracks, safely locking this area from other parts of the facility, creating a totally flexible space. A TRANSITIONAL ZONE FOR ADVISORY SERVICES. Guests meet their advisors at desks, messaged to cross-sell services and demo savvy new mobile and tablet technologies. Some needs are handled almost instantly. For more detailed conversations, private offices are nearby. Digital displays deliver dynamic content throughout the facility. FLEXIBLE SPACE IS ABOUT OPTIONS. AND OPPORTUNITY. Informal meeting space combines with a formal conference room. Slide open the glass walls. Roll away the custom bar-height tables, and you have a community meeting and educational space ready to seat 55 guests. THE HOME LOAN CENTER: A STORE WITHIN A STORE. It's a Sunday morning. And this branch is closed? Or is it? Strategically placed glass nano-walls allows parts of the branch to operate on hours of its choosing. The loan center has the ability to run on its unique schedule — including being open on Sunday's to serve those who want to get their home loan finalized after visiting that perfect open house. Special staging spaces provide quick informational meetings. With strong curb appeal on a busy Bellevue arterial, the BECU Eastside Financial Center makes a strong statement about BECU's commitment to their members, technology, and the Eastside community. This is truly a branch of the future.